Large spacious camping pitch with electrical hook up (6 people max) Please state the make and size of your tent or equipment in the notes section of the booking form so that we can be sure you have booked the most suitable pitch. 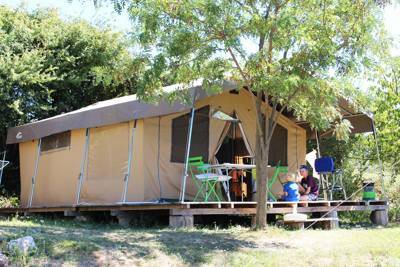 Family friendly canvas tents with large wooden terrace, nestle perfectly with the natural surrounding environment. Stay by the sea and enjoy the fresh air and natural surrounding in comfort! Large wood & canvas tent that can accommodate up to a family of 5. nestle perfectly with the natural surrounding environment. Stay by the sea and enjoy the fresh air and natural surrounding in comfort! It was back in 1966 that the two-mile bridge connecting the French island of Oléron to the mainland was built (the longest bridge in the country at the time). Before that it was a gorgeous, Biscay ferry journey that took you out to the isle, crossing the pearly blue sea and passing Naploenic Fort Boyard of 90’s TV fame. Admittedly the bridge does make holidaying on the island about ten times easier and has led to a wellspring of excellent campsites popping up in the area. 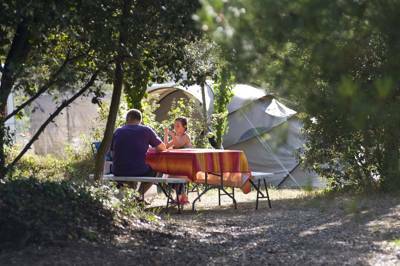 Among them is Huttopia Oleron les Pins , a wooded, 12-acre campsite with a pitch for every type of camper. Though shrouded among a shady maze of tall, slim trees and thick green shrubs, the campsite feels more like a sandy dune-scape than a forest. Sand under-foot makes it easy to pitch your tent and lends itself to all the activities on site; beach-style volleyball, boules and a children’s playground that also acts as one giant sand pit. The other facilities are built on sturdy wooden platforms – a pizza wagon and terrace, a heated swimming pool and a second paddling pool area. The decking is a perfect spot to laze away the evening after you’ve returned from the beach. For those without their own tent or campervan, there are some pre-pitched ‘glamping’ options too. These include safari tents, kitted out with kitchens, proper beds and extra furnishings, of which there are around 50 on the campsite. For the best of the tent spots, meanwhile, tuck yourself away in the most wooded areas at the back of the campsite and you’re sure of some extra privacy. Rent bikes from reception if you haven’t brought your own. It’s an easy pedal through the St Trojan forest to Petite Plage beach, just a kilometer away, while larger Gatseau beach is a few hundred meters further. Elsewhere, touring the pretty harbour villages and tasting the freshest of seafood is a must. You can also still take boat tours out from the island if you want to visit smaller isles and catch a glimpse of Fort Boyard for old time’s sake. Between bridge and boat you get the best of both worlds. 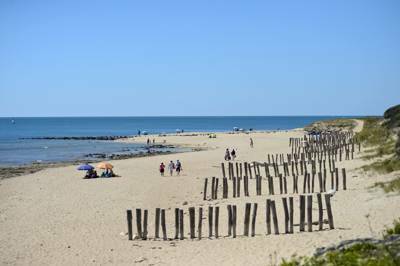 Set out to discover the many treasures and activities on the Oleron island, its villages and traditional ports, and of course its beautiful beaches, which are accessible by bike from the campsite. 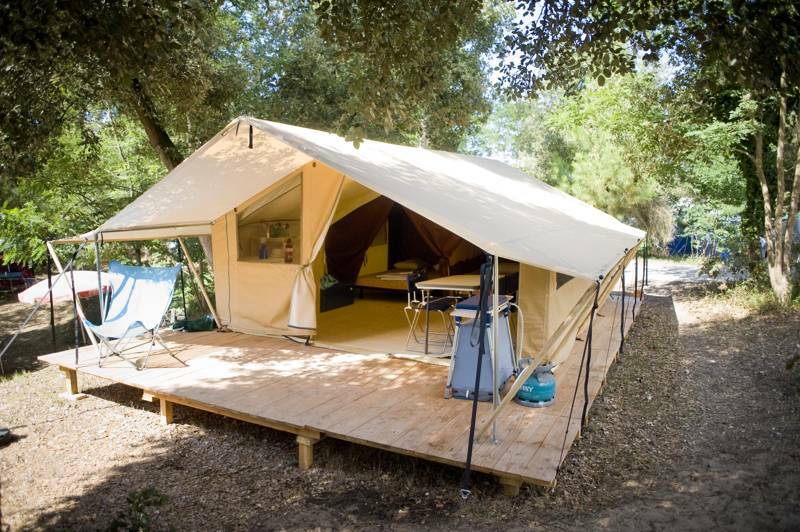 Camp in the heart of a majestic pine forest in Saint-Trojan-les-Bains. Enjoy the swimming pool and the bike rides on the island! For latest availability and best prices for Huttopia Oleron Les Pins, please use the Date Search above. 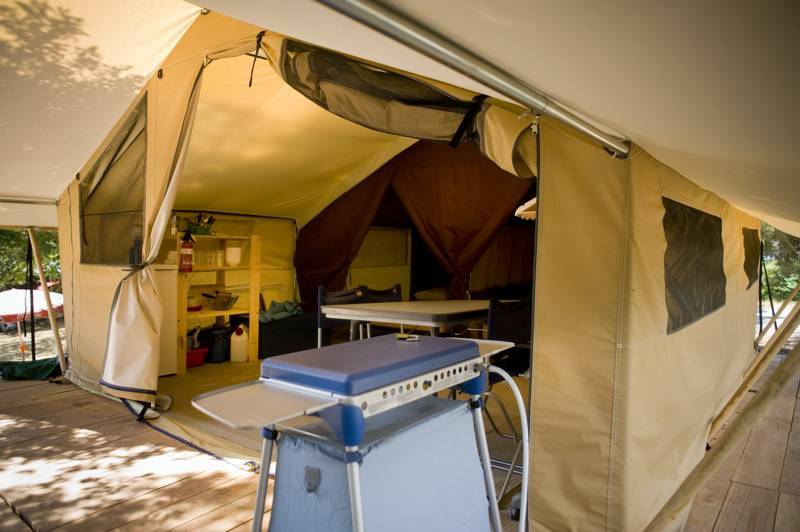 155 camping pitches and 60 pre-pitched and furnished safari tents. There's a heated swimming pool and paddling pool and surrounding wooden decking with a snack bar and pizza restaurant during peak season. A central lodge with internet and free Wi-Fi, a playground, boules pitch, table tennis, table football, volley ball court and indoor board games. 'Camper's corner' shop for any essentials you've forgotten, a library corner and tourist information in reception. Bikes available for hire. Activities for children throughout school holidays. The campsite has partnered up with an environmentally-friendly shellfish gathering company that lead groups out picking on the local beaches. Tours of the fish auction and a seaweed tasting discovery session are also available. The local beaches – Petite Plage and Gatseau Plage – are both within easy cycling range and are relatively well sign posted from the campsite. It's a nice route through the forest too – far nicer than driving. Be aware of strong currents around Gatseau Plage when swimming in summer. The snack wagon on site serves excellent homemade pizzas, along with a host of other snacks and drinks best enjoyed out on the terrace. It's only open over the May public holidays and through July and August. Outside of those times there are still plenty of great eateries in the nearby harbour towns – the best spots to go for fresh seafood. Camping pitches from €20.30 per night, including a pitch, 2 people, a vehicle and a tent or motorhome. Additional adults €3.70–€6.60; children under 4 years old free, and children between 4-10 years are free in low season and €4.60 in high season. Pets €2.30–€4.50. Glamping accommodation begins from €50 per night. • From Paris: take the A10 motorway, then take the exit for La Rochelle / Rochefort, and follow signs for Surgères / Rochefort / Ile d’Oléron. Take the road to St-Trojan-les-bains and follow signs for Huttopia. Shady, green, family camping just metres from the beach.